The Democratic National Committee offered Bernie Sander’s campaign a less favorable fundraising deal than Hillary Clinton’s, two forme officials say. With last year's primary still roiling the Democratic party more than a year later, two former Bernie Sanders campaign officials are charging the Democratic National Committee offered their campaign a less favorable fundraising deal than Hillary Clinton’s team received. The issue of whether the party was playing favorites in 2016 has been thrust to the fore this week after former DNC interim chair Donna Brazile released an excerpt of a forthcoming book that alleges the party, under her predecessor, essentially let itself be taken over by the Clinton campaign ahead of the 2016 presidential primaries through such an agreement. 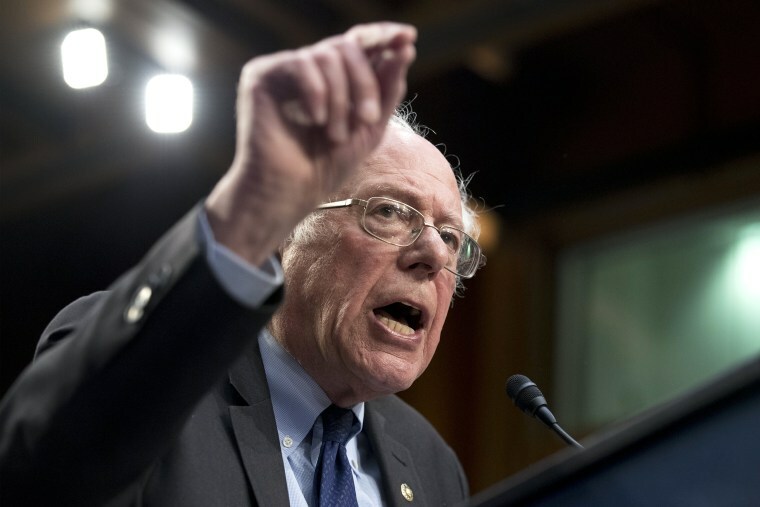 Almost two years since the start of the Democratic primary season, the party is still fighting many of the same battles, with both sides insisting they want to move on if only the other would let them. The allegations from Brazile, a longtime party operative who once managed Al Gore’s presidential campaign, have fed into Sanders supporters’ pre-existing grievances and left Clinton loyalists once again claiming there’s nothing to see here. Brazile called what happened a "cancer" on the party and said it revealed the DNC's unfair favoritism of Clinton during the primaries, when the national party organization was supposed to be neutral in such a contest. Sanders and Clinton both signed boilerplate joint fundraising agreements with the DNC in 2015, which created a vehicle to split proceeds between the campaigns and the party. But Clinton's campaign also negotiated a side deal, first reported by NBC News on Friday night, that gave it influence over staffing and other decisions at the DNC during the primary, but with the stipulation that it only affect preparations for the general election and that other candidates could strike a similar deal. The same offer was made to all candidates, Clinton allies have argued in countering Brazile, but only Clinton took advantage of it. And an email obtained by NBC News, first published by the Washington Post, shows the DNC's lawyers told the Sanders campaign they could have some influence over how money would be spent to prepare for the general election if they raised enough cash for the party. "[I]f you’re raising significantly more than the amount to cover the voter file for the DNC, DNC staff would be happy to chat with the Sanders team and come to an understanding about the best way to use those funds to prepare for the general election at the DNC," Graham Wilson of the firm Perkins Coie wrote. "The DNC has had discussions like this with the Clinton campaign and is of course willing to do so with all." However, Sanders' joint fundraising agreement with the DNC, signed in November, 2015, which was also obtained by NBC News, does not appear to include a supplemental deal. And two of the Sanders campaign’s former top officials say they were never specifically offered one like Clinton's and had no knowledge of their rival campaign's arrangement. "We had no addendum like this, no memorandum, no agreement like this," said Mark Longabaugh, who was the campaign's chief liaison to the DNC. "They basically came to us and said, here's the agreement, take it or leave it." "I had no idea there was side memorandum with the Clinton campaign," he added. Meanwhile, Jeff Weaver, the campaign's former campaign manager, dismissed the clause in Clinton’s agreement limiting engagement exclusively to general election activity as a fig leaf. "Throwing this catchall at the end saying that this document doesn't say what it says is a little disingenuous," he said. "Anybody who suggests we were being treated the same way is playing semantic games." Before the Clinton campaign and the DNC struck their deal in August of 2015, the DNC was struggling financially and in need of a rescue. The Clinton campaign stepped in to help, but wanted control over their how money would be spent, harboring doubts about the leadership of then-Chair Debbie Wasserman Schultz. Longabaugh acknowledged that the Sanders campaigns — which in the summer of 2015, had not yet become an online fundraising juggernaut — had little to offer the cash-strapped DNC and had to scrounge to pay the $250,000 bill for the party’s voter file. The campaign later began raising enough money to be in a position to contribute to the party, but its relationship with the DNC had deteriorated precipitously. Regardless of their intentions, Brazile argued in the excerpt published in Politico, the agreement had the effect of putting the Clinton campaign in a position of influence that Sanders and other campaigns did not enjoy, though she was careful not to claim the deal affect the outcome of the primary. Brazile wrote that she later called Sanders to tell him about the Clinton campaign's agreement in one of the more difficult phone calls of her career.